I was in Bangkok, Thailand, here I went to see the Grand Palace and Wat Pho (aka Temple of the Reclining Buddha) or you may call it Wat Phra Chettuphon Wimon Mangkhalaram Ratchaworamahawihan, which is it official Thai name. Walking around the temple ground I came by this lady sitting and looking around, I pointed at my camera to indicate if it was ok to take her picture, she nodded a started praying. I took my shoot, thank her and walk away. I haven’t done that much to this photo in the post process other than the usual contrast adjustment and a crop, to get a little closer to her. There was a fence between us, so I wasn’t able to get as close to her as I wanted to. The photo was original in color, but after looking at it for some time, I decided to convert it to black and white, and I’m glad that I did, cause it works better that way. 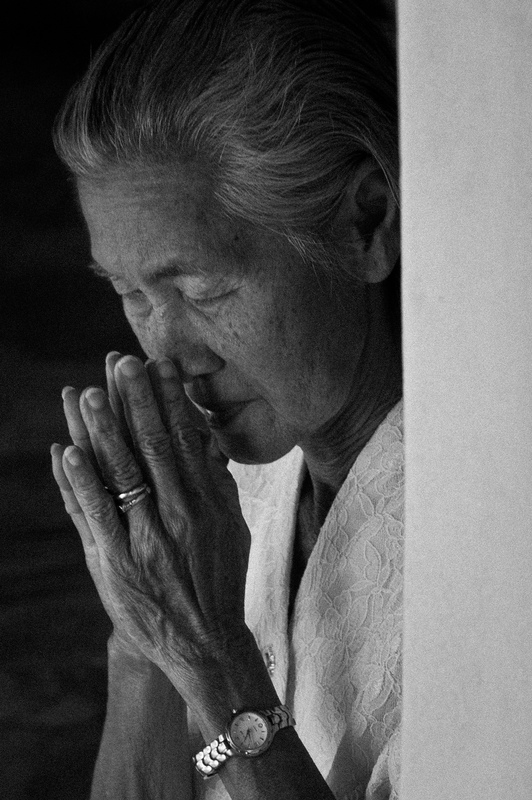 A Prayer in Wat Pho by Bo47 is licensed under a Creative Commons Attribution-NonCommercial-NoDerivatives 4.0 International License.